For the second time in less than a week, New York Times public editor Margaret Sullivan has taken the paper to task for its reporting. …Of the six front-page articles on Jan. 13, only one can be described as hard news: an article from Paris about negotiators putting the last touches on a deal to freeze Iran’s nuclear program. The other five are: a reconstruction of the “Bridgegate” scandal; a news-feature story about relics restored to the National Museum of Afghanistan; an article about politics in Minnesota and Wisconsin; a setup story about Supreme Court arguments on the collision of free speech and abortion rights; and a feature about a high-end pawn broker. Sullivan said she started thinking about this after a reader complained that there wasn’t a single news story on the front page of the Nov. 26, 2013 paper, calling the stories “interpretive journalism” as compared to the “real news” on the front page of The Wall Street Journal. In general, I found an emphasis on interpretive and enterprise journalism. I also found many examples of interesting and well-written articles with little news value. We have to ask ourselves what’s new and surprising and important to people – what we can offer that no one else can. So we put pressure on ourselves to put it in perspective or say what it means or give the backstory. In my view, the Times’s most prominently displayed stories sometimes go too far in the direction of interpretation, analysis and elaborate writing. The reasonable reader…might well wish that the important nugget of news would appear in the second paragraph instead of the seventh. That reader (as opposed to a journalist who is plugged in to changing events all day long) may prefer more of the original news and less of a “second day” approach. In some cases, a breaking news article that appeared on the website all day long, frequently updated, never even makes it into the Times archive, pushed aside by the more interpretive article that appears in print the next day, but where the news is obscured. 2. Read the excerpt below. NY Times managing editor Dean Baquet stated to public editor Margaret Sullivan that the ideal front page would include three or four “strong news stories that nobody else has, an investigative story, and a couple of really good reads.” Consider the fact that The New York Times is considered the newspaper of record. (Newspaper of record is a term that typically refers to a major newspaper that has a large circulation and whose editorial and news-gathering functions are considered professional and typically authoritative.) 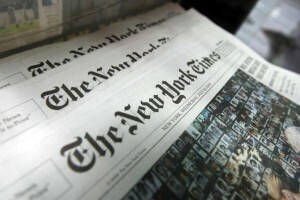 Do you think Ms. Sullivan and Mr. Baquet’s exchange shows that the Times is not living up to this reputation? Explain your answer. 3. News stories are basically divided into two types: hard news and soft news. Hard news generally refers to up-to-the-minute news and events that are reported immediately, while soft news is background information or human-interest stories. Politics, war, economics and crime used to be considered hard news, while arts, entertainment and lifestyles were considered soft news. One difference between hard and soft news is the tone of presentation. A hard news story takes a factual approach: What happened? Who was involved? Where and when did it happen? Why? A soft news story tries instead to entertain or advise the reader. You may have come across newspaper or TV stories that promise “news you can use.” Examples might be tips on how to stretch properly before exercising, or what to look for when buying a new computer. Knowing the difference between hard and soft news helps you develop a sense of how news is covered, and what sorts of stories different news media tend to publish or broadcast. CHALLENGE: for a week visit the homepage of 2-3 major news sources: CNN, The New York Times, your state’s largest newspaper, one of the network news websites (ABC, CBS, NBC). Also, wire service Reuters.com or YahooNews which uses mainly AP stories. On any given day at the same time, how many of the featured, or breaking stories are hard news, how many are soft? Record the news source, the types of stories/headlines, etc.